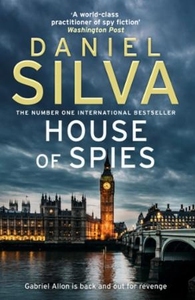 Gabriel Allon is back and out for revenge From the No.1 New York Times bestselling author of The Black Widow comes the thrilling new blockbuster featuring legendary spy, assassin and art restorer Gabriel Allon. Four months after the deadliest attack on the American homeland since 9/11, terrorists leave a trail of carnage through London's West End. The attack is a brilliant feat of planning and secrecy, except for a single thread. The thread leads legendary spy, art restorer, and assassin Gabriel Allon and his team to the south of France and the doorstep of Jean-Luc Martel and Olivia Watson. A beautiful former fashion model, Olivia pretends not to know that the true source of Martel's enormous wealth is drugs. And Martel, likewise, turns a blind eye to the fact he is doing business with a man whose objective is the very destruction of the West. Together, under Gabriel's skilled hand, they will become an unlikely pair of heroes in the global war on terrorism.